Fine Arts Center Blog: NEW Acquisition: Kenneth O. Goehring's "Marina II"
NEW Acquisition: Kenneth O. Goehring's "Marina II"
Kenneth O. Goehring, Marina II, oil on canvas, 1990. This Abstract Expressionist painter goes by Ken Goehring too — he signed many of his paintings without the middle initial. A WWII veteran, Goehring lived an art-filled life even before serving in the army. He studied at the Meinzinger School of Applied Art in Detroit, then after the war, Goehring and his wife moved to Colorado Springs where he stayed until his death in 2007. Westword wrote an obituary commemorating Goehring's importance to the Colorado abstract scene. In Colorado Springs, Goehring studied at the Colorado Springs Fine Arts Center from 1947-50. He painted under Jean Charlot and Emerson Woelffer — two great teachers in FAC history. Goehring admitted that he shared a greater sense of kinship between Woelffer and himself. 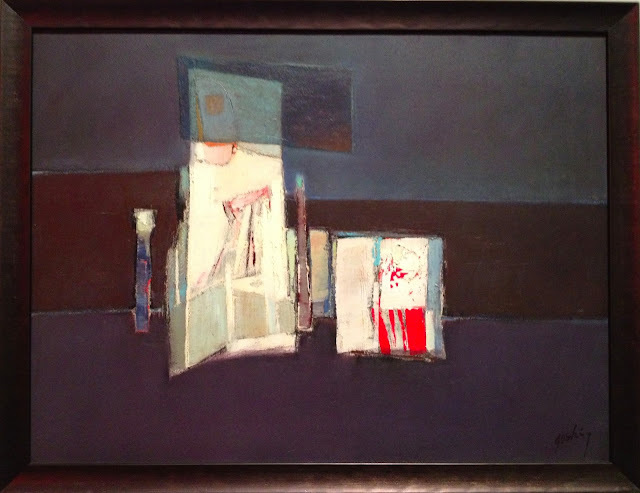 Woelffer was also an abstract expressionist who widely used geometric shapes, much like Goehring's rectangles in the piece above, and bold color, like the splashes of red above. Goehring's influential contributions to the abstract Colorado art scene is part of his his legacy, so check it out in the first-floor galleries today! Tues. - Sun | 10 a.m. - 5 p.m.